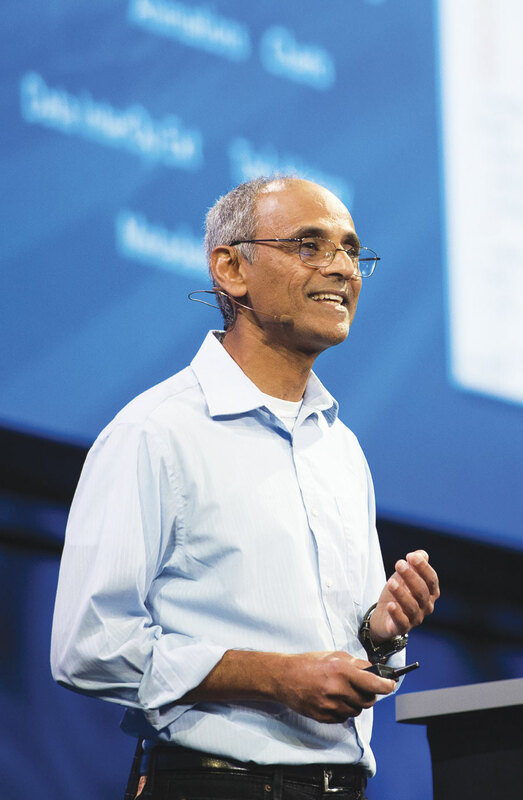 "Our world is changing," said Esri software development director Sud Menon during the opening of the 2016 Esri Developer Summit (DevSummit). 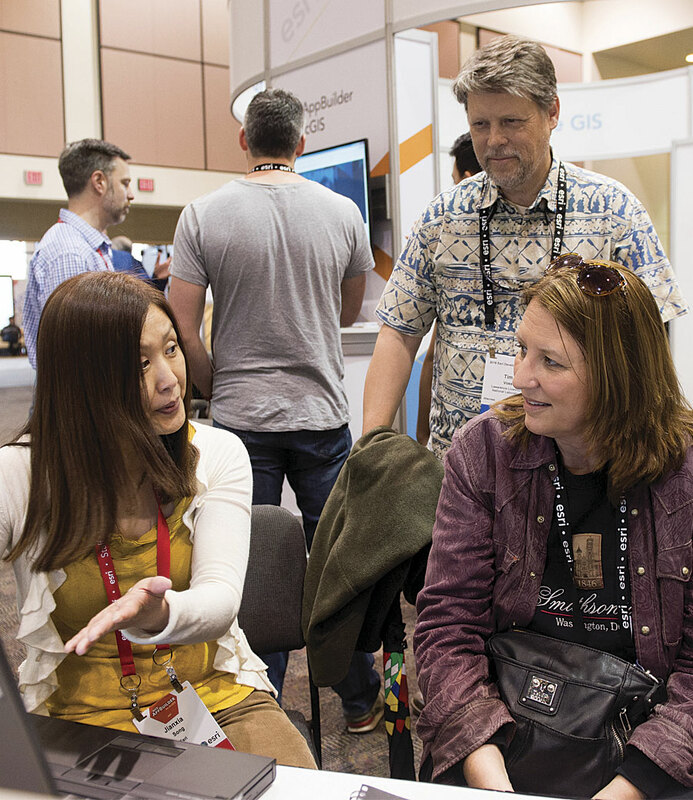 "And ArcGIS is changing too"—to embrace this new reality. "The platform, from my experience and my 50 years in doing this kind of work—there's never been anything like it," proclaimed Esri president Jack Dangermond. "The opportunity to be able to extend and expand and be creative with the kind of tools that are coming down the pathway—and are already here—is unparalleled." "We are doing this in both the user experience as well as in the functionality," Menon said. "In the latter, we are really looking at working with big data, harvesting the power of distributed computing. And we refer to that initiative as geoanalytics." "We all know data is important," said Art Haddad, chief technology officer of location analytics for Esri. "But it's not as important as the answers it provides or the stories that it tells." "Now we can explore those [crime] patterns changing over time across the city," she said. "Analysis is very much a part of Insights," Beale said. "The data format determines the kind of on-the-fly analysis that can be done, either through drag and drop or by using the action button." "I was really impressed with the advances in charts and graphs that Esri has made," said Johnson Pham, who also volunteers at the La Brea Tar Pits and Museum in Los Angeles, where fossil excavations have taken place since the early 1900s. 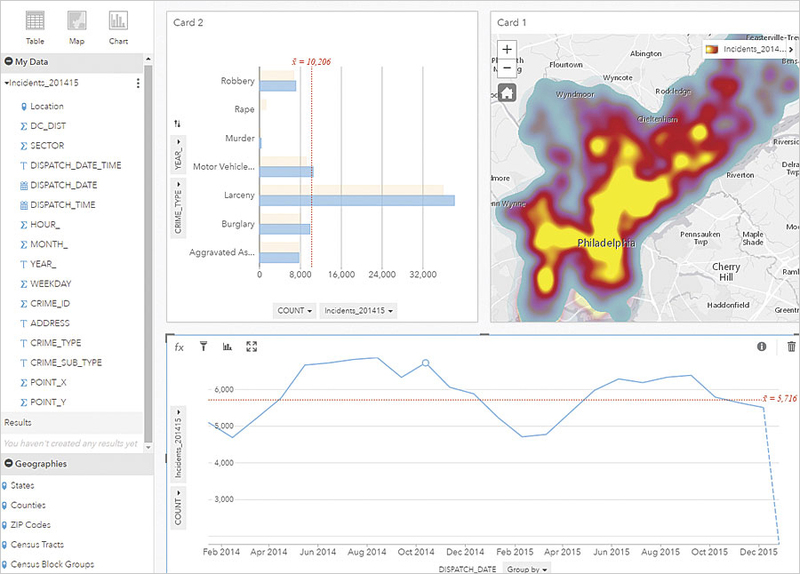 "The interactive charts and maps in Insights are fast, visually appealing, and easy to use." 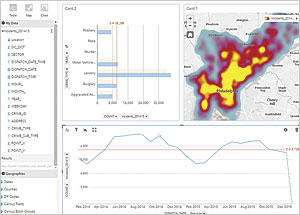 "With Quartz…we are releasing a significant set of functionality for you as developers," announced Euan Cameron, chief technology officer for the Runtime group at Esri. "What does that mean?" Cameron asked. "It means the design of the widgets works great on mobile devices, as well as the traditional desktop browsers." He advised the app developers to heed a line from the book Wind, Sand, and Stars, by French aviator and writer Antoine de Saint-Exupéry: "It seems that perfection is attained not when there is nothing more to add, but when there is nothing more to remove." "Just a brilliant sentence," lauded Crockford. "He was talking about the design of airplanes, but it really seems to apply to everything. […] And it applies especially, I think, to software because we have requirements in software that programs need to be perfect. Because if a program is not perfect, then the computer has a license to do the worst possible thing at the worst possible time." To make apps perfect then, developers need to slenderize them rather than build them up—just as programming languages should be edited down to just the essentials, or the "good parts." "If a feature of a programming language is sometimes useful and sometimes dangerous, and if there is a better option, then always use the better option," he cautioned. "We are not paid to use every feature of the language. We are paid to write programs that work well and are free of error." "There is a lot of interest…in real, live data," she said. "It is important to my job because we need up-to-the-minute data on disasters like earthquakes and tsunamis, as well as conflict areas where the security of our staff and beneficiaries [is] at risk." "At the La Brea Tar Pits, the emphasis is that discoveries are made daily," said Johnson Pham. "What better way is there to show that to museum visitors than to have a live interactive app featured in the museum with an updated count of new fossils discovered and new, exciting paleontological discoveries made each day?"